Scheduling your shoot has never been easier. 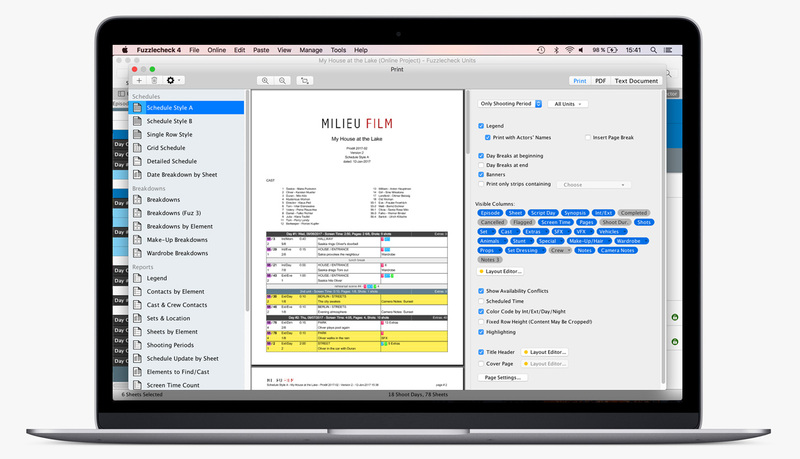 Try Germany's most successful film preproduction software. Multiple users can work on the same project at once using Online Projects. Fuzzlecheck 4 offers a variety of printouts to suit your needs. Project Calendar shows events, cast and crew availabilities, shoot days and holidays. All your crew members can work on the same projects at once in an online project. Up to 20 people can collaborate and share their data with all other departments. You can grant individual access rights for each user. For example, you can give write access in the costume category to members of your costume department only. If you don’t want your preliminary shooting shedule to be published yet, simply set it as private, or make it visible only to certain people. 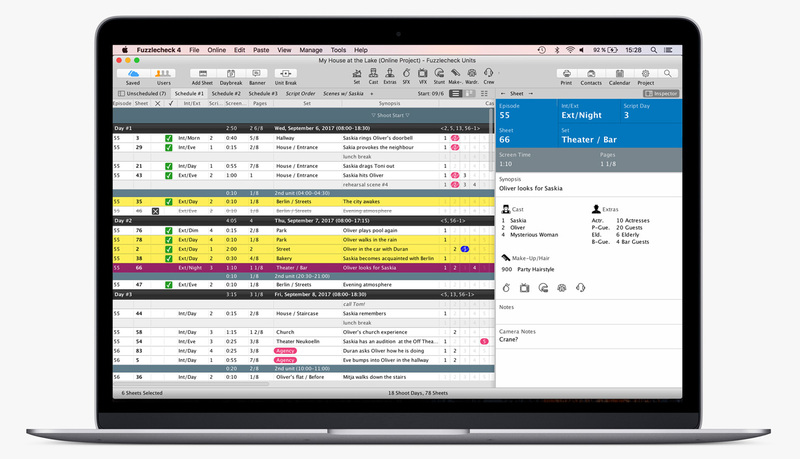 Fuzzlecheck offers all the tools you need for media preproduction. Fuzzlecheck can import your screenplay, calculate sunrise and sunset times for your shoot location, warn you about availability conflicts for your actors or generate your daily call sheet. In this upgrade, we’ve also added new features, like Intelligent Extras Management, Stop Watch and Rest Periods Control. Fuzzlecheck has become the industry standard for German film productions because of its user-friendly interface. Fuzzlecheck 4 offers a lot of new features, which we’ve worked hard to integrate seamlessly. We’ve improved many of the windows and dialogs to make your work more efficient. Fuzzlecheck 4 offers complete support for coordinating multiple teams on the same shooting day. Unit Management addresses big feature film productions with 2nd and 3rd units as well as series productions which shoot with multiple units every single day. There is no limit to the number of units you can schedule. Fuzzlecheck has beautifully designed reports for all your needs. 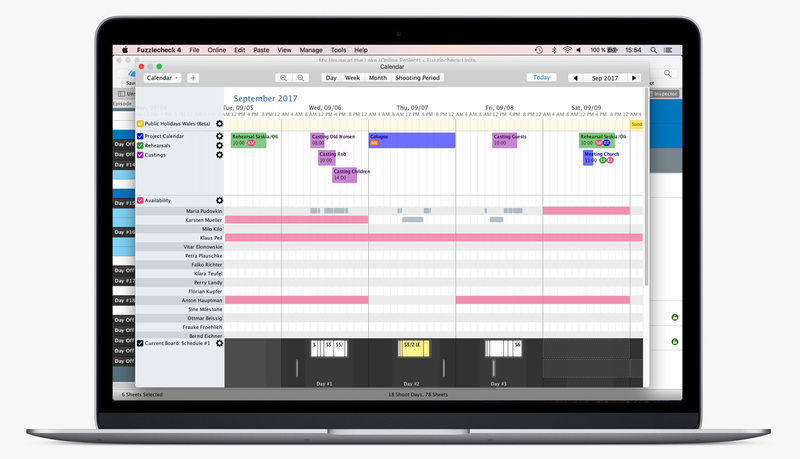 It offers a standard Shooting Schedule, Shoot Times Comparison Chart, Day-out-of-Days, a Daily Call Sheet Template and many more. Print your reports in PDF, Word document or Excel format. Data encryption and privacy is very import to us. The application communicates with our server using a modern end-to-end encryption. Your online projects' data will be encrypted using your password and only users of your projects have access. Fuzzlecheck 4's highest level of security protects your data completely, so not even our support team has access to your data. While the 1st AD breaks down the script, a production assistant can already get started on cast and crew contact data. Up to 20 people can work at the same time on the same document. Online Projects are edited within the regular Fuzzlecheck desktop application, avoiding unreliable internet browsers. Fuzzlecheck Standard offers everything you need to make a basic shooting schedule. Fuzzlecheck Pro is for professionals, has more tools and lets you customize your printing layouts. Fuzzlecheck Units supports multiple units and series productions with episodes. Data exchange between all editions is fully supported. Fuzzlecheck offers a free trial version, so you can find out which edition works best for you. You can also try out online projects with multiple users in the trial version. Trial projects cannot be printed or saved and are deleted after 24 hours. What's new in Fuzzlecheck 4? Online Projects allow multiple users to work on the same project. Fuzzlecheck Units is a new edition which lets you coordinate multiple units on the same shoot day. We've also made many smaller improvements to the software to make your work more efficient and make Fuzzlecheck even better: for example, we improved the Extras Management tool, plus added a stop watch and the ability to split scenes. Calculation of "Estimated Time" and "Shoot Duration"
Allows you to create and edit projects offline. The license is valid for 5 years for one person and can be activated on any Mac or PC (for Fuzzlecheck 3 users we are offering an upgrade). Important: you do not need a single-user license to create an Online Project. Purchasing an Online Project gives you the ability to add 4, 8 or 20 users to the project, depending on the edition. Each individual user does not need their own license. After expiry, you can renew the project or save it to your local hard drive. Fuzzlecheck Education: We support students, schools and universities with reduced prices on licenses and Online Projects.